Battery-operated Germ-Free Toothbrush Case works with most manual and electric toothbrushes. 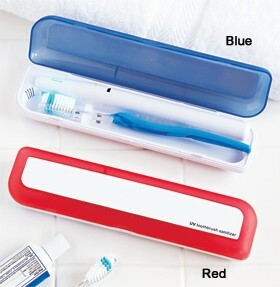 Using UV light, this case sanitizes and stores your toothbrush at home or while traveling. It features an LED indicator light and a timer that shuts off the UV light automatically after 5 minutes. The UV light also turns off when the cover is opened. Durable plastic case (8-1/2" x 2" x 1-1/8") is available in Blue and Red.